Heath Ledger stars as Dan, a young man who falls in love with Candy (Cornish), but their addiction to drugs threatens their relationship. Heath Ledger has starred in such films as Casanova, Brokeback Mountain, The Brothers Grimm, The Four Feathers, A Knight's Tale, The Patriot, and 10 Things I Hate About You. He will next be seen in I'm Not There and The Dark Knight. I had the privalege to interview her. 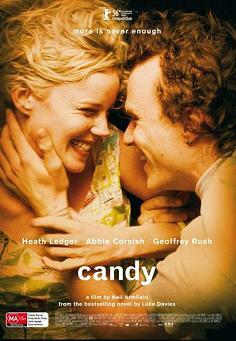 THINKfilm will release Candy on November 17th, 2006 at the Angelika. NNYC MOVIE GURU: Do you think anyone can improvise? NYC MOVIE GURU: How do you think drugs are presented in the media? HL: Drugs and alcohol have been obviously glorified and idolized in a way into the art world, whether it be watching Jackson Pollock paint with a bottle of booze in his hands and a cigarette hanging out of his mouth, we’ve connected that to what it takes to create something when, in fact, it’s anything but the truth. Obviously, creation comes from your mind and it’s hard to create when you’re all phased or drugged-out. I’m sure that drugs and alcohol perhaps would inspire new thoughts, but it’s certainly not what I use as a tool or a mechanism to create. NYC MOVIE GURU: Do you think Candy glorifies drugs in any way? HL: I can’t honestly say that it was a concern of mine. I guess if I knew the context within the script, it wasn’t really glorifying it. I think it ended up being a cautionary tale, if anything. NYC MOVIE GURU: Would you consider Candy to be a love story? HL: It’s a love triangle between him [and] the drug [and the girl]. I think that we were telling ourselves it was more of a story of love than a story about heroin. NYC MOVIE GURU: Why did you choose this role? HL: It was the opportunity to work at home again. The scripts in Australia are slim pickings these days and it was the best one available. It had been 8 years since I had used my own accent in a movie and I was curious to see what that would be like. NYC MOVIE GURU: How did you prepare for this role? HL: Physically, I stayed out of the sun and I tried to eat less. Abby [Cornish] and I went to the center in Sydney called NUAA, which is the Narcotics Users Association of Australia. We met a gentleman who has been using [drugs] and still [has been] over the last 20 years. He took us into a board room and opened up what looked like a rifle case and inside was a prosthetic arm which was designed to train nurses. Within this center, it was designed to train drug addicts: how to find veins. The veins were fully functional. During the drying-out sequence, we had some one on set to take us [step-by-step] through the stages: you’re in a cold sweat, the next scene your stomach feels like it’s twisted into a knot [and you have a headache]. We just responded to his knowledge of [these symptoms]. NYC MOVIE GURU: When did you read the book that it’s based on, Candy: A Novel of Love and Addiction? HL: I read the book beforehand a couple of times—it was a quick read. The author, [Luke Davies], was on the set every day. He [co-wrote] the screenplay and he had been through a similar experience, so he was [a] source of information. NYC MOVIE GURU: What did you learn from your role? HL: The desperation of it and the need to want to be accepted and [also] feeling secluded from society. They feel alienated by their illness. When they’re in the thick of their addiction, they don’t see an ending to it, so they just want to be treated normally. NYC MOVIE GURU: How has having kids changed career? HL: I didn’t immediately get an urge to go out to be a voice in an animated film, [but] it definitely changes the person [I am] and [my] personal evolution runs hand-in-hand to [my] professional evolution. [They] grow simultaneously. NYC MOVIE GURU: Which director would you like to work with? HL: Terrence Malick. I’d really like to be in one of his visual poems, [so-to-speak]. NYC MOVIE GURU: What's next for you? HL: Next up, I’ll be playing The Joker [in The Dark Knight] next year.